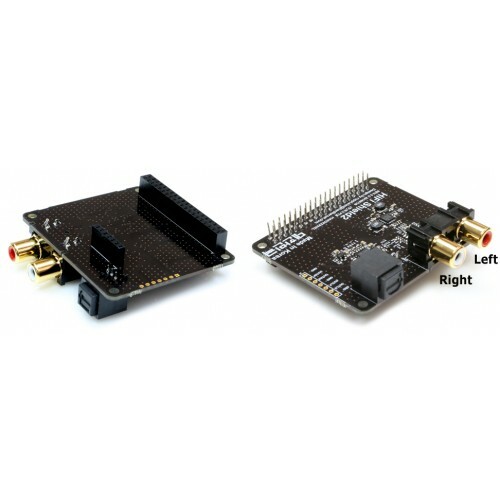 The HiFi Shield provides both stereo RCA connectors and a 3.5mm stereo jack (all gold-plated) to connect to external amplifiers and other audio equipment. Via TI's high-end PCM5102 DAC chip, it supports 16 to 24 bit audio formats with minimal distortion (-93dB) and ideal dynamics (100dB+), plus amazing sampling rates of 192kHz. Works with the ODROID-C1+. This is not compatible with the original ODROID-C1. 1. The DAC chip uses a high-end PCM5102 chip from Burr-Brown company (now part of TI) which utilizes the I2S interface. It supports 16 to 24 bit audio formats with minimal distortion (-93dB) and ideal dynamics (100dB+), plus amazing sampling rates of 192kHz.